Storing large quantities of goods or raw materials can be a challenge within any warehouse as you need to ensure that your goods are protected and organized and that the shelves can withstand the goods you are storing. You also need to ensure that the shelves make effective use of your warehouse space. Don’t Assume That Used Shelves Are The Right Choice. New shelves can often be just as cost effective as purchasing used shelves, especially when considering the costs of disassembly, assembly, and delivery. With new shelves, you can also maximize the use of your space, and you can rest assured that you are getting a reliable product that will stand the test of time. Consider The Floor Space Layout In Your Warehouse. This should be a relevant factor in deciding what types and amounts of shelving you need. Warehouse space is not unlimited and it is not free. You do not want to waste space by having inefficient shelving solutions that don’t allow you to effectively store all of your goods. Understand The Different Shelving Options Available To You. Not all warehouse shelving is created equal. There are different types and styles of shelving, including galvanized steel shelving, rivet shelving, mezzanine shelving, pallet racking, and mobile shelving. If you need some specific type of shelving designed that will work best with your warehouse layout or the goods that you need to store, you can also consider custom and specialized shelving solutions. You must ensure that every shelf is strong enough to withstand the weight of whatever you might put onto it both now and in the future. You should always err on the side of caution and opt for shelves that can hold larger volumes and weights of items than you expect to need so that your shelves can always safely accommodate your storage needs. Consider Whether The Shelves Will Hold Up In A Potential Disaster Situation. You will want to ensure that the warehouse shelves could stand up to a serious adverse weather event, such as an earthquake. Your shelves need to be strong enough to withstand the weather events that are likely to occur in your area. Do you want to obtain your shelves from a company that will also arrange delivery and installation? This can streamline the process and allow you to work only with one company from start to finish, but it may not be the right solution for everyone. These are just a few of the many tips when it comes to making the purchase of industrial shelving or warehouse racking. If you turn to a professional who specializes in warehousing shelving, you will get the invaluable advice that you need to ensure that you have the right shelves for your space. 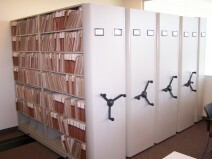 Cabinets come in many shapes and sizes but all can essentially be categorized as either enclosures or drawer cabinets. Enclosure cabinets typically have doors on the front face and shelves of one sort or another internally. The doors or door, may be hinged, roll-up, see through, or fireproof for high valued items, files or documentation. Because the cabinet market is so vast, it naturally follows that cabinet manufacturers must specialize on different market sectors and/or applications when introducing their product to market. Parts rooms, or stores rooms, although quite varied in appearance and function, share a number of characteristics that many cabinet manufacturers focus in on to better enhance these work environments and better position themselves in the market. The most common or essential characteristics are security, ergonomics, space savings and productivity. Traditional stores rooms commonly use totes stored on shelves to store the majority of their small parts. Parts are catalogued by either commonality or family grouping and the totes are located by a sequenced code to aid in the storage and retrieval process. In most stores rooms these totes vary in size but to only a limited degree. This is where modular cabinets have increasingly been recognized as not only a storage medium but also a productivity enhancing work tool. 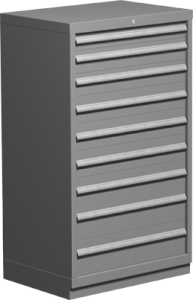 These modular cabinets can provide drawer heights that are perfectly suited to the inventory, and when sub-divided, allow storage of a multitude of SKU’s within the same drawer. This improved space utilization can lead to space savings of as much as 70 percent over conventional tote storage. With the reduced travel between pick hits productivity is sure to increase. It is simply bonus that security is also enhanced seeing as most such cabinets are also lockable. 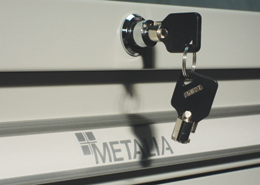 Metalia Cabinets with their European styling and heavy gauge welded steel construction provide one of the industry’s best modular cabinets with approximately 400 lbs. capacity per drawer on full ball bearing sliders. These units come with a lifetime warranty and are also available as a retrofit to your existing shelving system. These cabinets are available in numerous shapes, configurations and colours to meet virtually any stores room requirement. Automotive dealers are increasingly recognizing that quality of service and craftsmanship doesn’t simply end with their own offerings. More and more of the car manufacturers have now recognized that their entire dealership is indeed a showroom, and of course, needs to presented as such. Metalia Cabinets has directly addressed these concerns by now offering shop cabinetry specifically designed for the automotive bay floor. These all welded, powder coated workbenches will stand up to the most abusive conditions and yet still remain as beautiful as the day they were bought for many years to come. The Metalia Royal workstations are built completely modular so that the customer may pick and choose what components are most appropriate for his space and budget requirements. 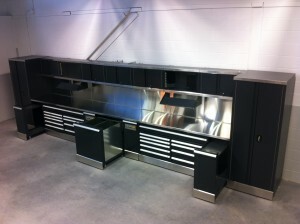 Whether it be tool storage, hoist pneumatics, or simply coverall storage, this cabinetry covers it all. Good question. It depends. What kind of business do you have? Cantilever racks are what a business needs if their product cannot fit vertically on regular pallet rack. They’re great for businesses that have warehouses – like a lumberyard or a manufacturing facility. Often times, companies can have items like sheet metal, drywall, sheet steel, or even flake board as piles on a warehouse floor. Warehouse employees are typically tasked with sorting or organizing items like this, which is often an inefficient use of time and poses a risk of injury. Cantilever racking is great for sorting product by commodity and size and can significantly reduce the likelihood of accidents. This racking is typically built of structural steel and has been used for the storage of everything from mouldings to pipe. Although it’s simplistic design is straightforward from an installation point of view, it’s weight does sometimes present a challenge. By what means are the loads going to be deposited into the rack and do you have enough aisle space to do so? What should be the ideal column spacing so that the arms cradle the load effectively? What is the vertical rise opening per level that would be reasonable to both deposit and retrieve the loads? Should the arms be straight or slightly inclined so that any loose product will roll towards the center of the rack? Should the arms have locking pins so that product can’t accidentally fall out? What is the ideal depth of the arms to maintain the loads stored? Based upon this depth and the chosen column spacing, what is the minimum arm capacity? Cantilever systems are best tailor designed to the space meant to be installed into, but this, as evidenced above, is also supported by knowing the kinds of materials you’re working with. Whether you find yourself in the market for office shelving or something of a more industrial nature, you will quickly find that the lines are becoming increasingly blurred when it comes to discerning what constitutes a shelving unit and what is a cabinet. With such a wide array of manufacturers in the market to choose from, and the competition growing ever more fierce, every effort is being made on the part of these manufacturers to accommodate all their clients potential application requirements with one basic list of standardized components. These components, or more specifically, options, allow you to custom design a shelving unit exactly to fit your business needs. Although the basic building blocks remain unchanged, these days many manufacturers offer a numberof options that may come as a surprise for the occasional purchaser of shelving. As image and aestheticsincreasingly play a higher role in corporate decisions, decorative end panels are becoming increasinglymore popular in an industrial setting. Where previously lockable cabinets were the storage answer formore valuable items, now lockable doors and / or drawers may suffice. Clients increasingly recognizethat versatility is key. There is also an increased number of options available specifically for space efficiency. As an example, tominimize a storage footprint, or more specifically the number of shelving units required to store totes,subdivided drawers are a fantastic idea; allowing a customer to replace 3 or more shelving units intoone. Once again, previously the customer was typically steered towards purchasing a cabinet for sucha solution. With the shelving drawer inserts available on the market today, most suited to a number ofdifferent shelving brands, these specific cabinet applications are becoming increasingly rare. What Is Push Back Racking and When Should I Use It? Two key objectives in any good warehouse design are space efficiency and productivity. These objectives can come together nicely in an effectively planned push back racking system where we combine less travel between pick hits and provide maximum density by way of storing several pallets deep, but first of all – what is push back racking? Push back racking is commercial and industrial racking with greater selectivity. All loads are stored and retrieved from the aisle and rest on a cart on a rail that slopes gently toward the front. When a new load is deposited into a lane, it ‘pushes back’ the one already at the face of the aisle and all those behind. Then, when that load is picked, the contents of the lane all move gently forward again, hence the term “push back rack”. Push back racking is ideally suited to business that stores skids of product SKU with a last in first out method. In order to examine whether such a racking system is appropriate to your application you must first ask yourself a few simple questions. How many of your SKU’s typically maintain inventory levels of 5 to 15 pallet loads? Will the number of SKU’s maintaining this level of inventory be relatively constant? A properly applied push back system provides both excellent density as well as selectivity. The objective once again is to minimize the amount of travel between pick hits and to store product as densely as possible. The workings of such a system are that the loads are placed on either carts or rails which sit slightly inclined within the racking structure. The lift truck operator will simply place the first load on a cart and when he then has a second identical load he deposits it in that same lane location; therefore, pushing the original load and its’ cart, up the inclined rails and then depositing the next load directly in front of the first. Push back systems are generally designed 2 to 5 pallets deep depending on heights, load weights, and the type of lift truck used to interface. The carts within the system nest beneath each other when not in use and typically provide the operator with some sort of signalization notifying him of the number of positions remaining within the lane. 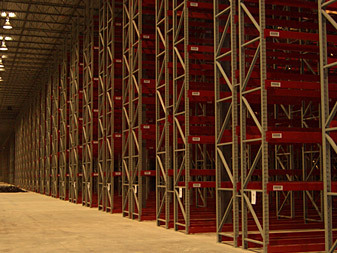 As with any racking application good utilization is critical. One must take a serious look at average inventory levels and assess both what is the optimal pallet depth required and how much of such a system is warranted. As with most any warehouse, good space efficiency and productivity requires a combination of 3 or more different systems. It wasn’t long ago that when one referred to a 28,000 lb. capacity end frame they use to be describing a 13 gauge, rolled formed frame. As a common staple to the racking industry, this frame would also typically be about 16 to 24 feet in height and be relatively easy to come by. Today, however; if you were to assume the same, you might be mistaken. Firstly, in the past 3 to 4 years the industry has become increasingly more sensitive in providing the customer with a more precise solution to address his storage issues. Always wishing to stay just slightly ahead of their competitors, manufacturers have reduced the gauge of their rack frames and increased the welds, bends or both therefore providing increased rigidity and strength. It also stands to reason that a frame’s capacity will in large part be determined by how structurally sound the base of the structure is; an issue in large part determined by the height of the first level load beams. It’s for this reason lighter gauge rack may often still suffice in achieving the desired capacity objectives of a customer’s requirements. 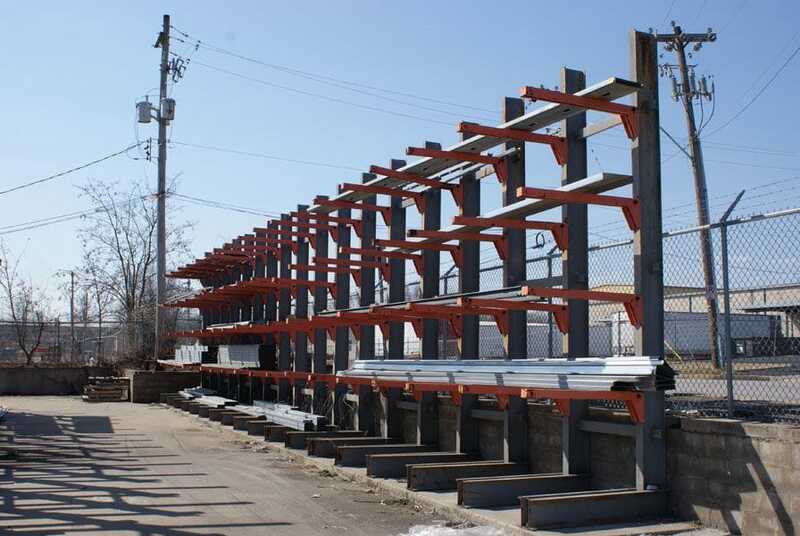 The fact to keep in mind is that whether it be a 13, or 14 gauge steel frame, if the elevation of the first beam level is relatively high, the rack will inevitably be more susceptible to lateral forces than otherwise may be the case and therefore it’s capacity will also be that much less.